Your writings are filled with references to many great religious and philosophical thinkers. Two recurring names in your writings are the Kotzker Rebbe and Baruch Spinoza. Can you share a little about what these two thinkers mean to you? What have they, in their own ways, taught you about life? Nathan Lopes Cardozo: It would be too much to say that I was “raised on the knees” of Spinoza, but it’s definitely true that my father was a great admirer of his and often spoke about him and his teachings. I’m not sure if he understood Spinoza or just used some of his ideas to justify his own secular life style. My father had all of his major works in Dutch and many other introductions to Spinoza’s philosophy. I read them all as a youngster, although some were really over my head. I found it most painful that somebody was banned for speaking his mind. After all, a ban is an expression of fear and is in fact very un-Jewish. I believe something else was going on in me subconsciously. However much I realized that Spinoza was not as truthful as he wanted his readers to believe, I had a weak spot for him because of the way he was treated. Since my childhood, I abhor close-mindedness and attempts to use power in order to silence somebody. Clearly, it was my father who instilled this in me. But Dutch society at large, which has always been very liberal, also played a role. This is why in the seventeenth century, unlike almost any other country in Europe, it allowed Jews to come and live in the Dutch republic and practice their religion more or less openly. Many works of so-called heresy, which could not be published in any other country, were published in Amsterdam in the same and later centuries. The fact that today you can legally buy soft drugs and that (many kinds of) euthanasia and prostitution are legalized is the other side of the coin. While I will surely not compare my mind with Spinoza’s intellectual genius (and there really is no comparison! ), I do encounter a lot of opposition from people who try to silence me in ways that are not far removed from those used against Spinoza. (I indeed nearly had a ban imposed on me.) One thing I definitely learned from him and that is the way to react to this. He stayed calm, almost never lost his temper, and continued to live with an inner tranquility, although I am convinced that sometimes he must have been deeply hurt. I think you can find this in some of his harsher observations in his Tractatus Theologico Politicus. But the greatest tragedy is that Spinoza was lost to the Jewish people and Judaism. The rabbis who dealt with him didn’t know how to approach him and his as yet underdeveloped opinions. They reacted out of fear, which is the worst thing you can do when you’re confronted with a young man who is struggling with his Jewish identity and Judaism. Instead of appreciating the struggle, they couldn’t cope with doubt and challenge and took the easiest way by casting him out of the Jewish community. The truth is that the City of Amsterdam also played a huge role in this. They had made a condition that the Jewish community could stay in the city only as long as it would not make any problems for Christianity. When Spinoza began to express his thoughts and challenge orthodox Christian beliefs, the city had the right to expel the entire Portuguese Spanish Jewish community, something that the leaders of that community wanted to prevent at all costs. They therefore decided to impose a harsh ban on Spinoza so as to show the City of Amsterdam that they no longer considered him one of theirs and could not take any responsibility for him. It seems that Spinoza was then forced to leave Amsterdam. The ban worked; otherwise I would have been born in another country! To this day, any challenge to its tradition and beliefs is still one of the greatest fears of the Orthodox Jewish community, and I have no doubt that this has done, and still does, a lot of harm to Judaism in our own days. Lots of young people cannot live with this kind of dogmatic Judaism and therefore walk out. 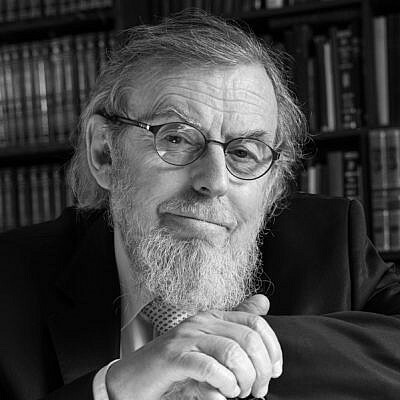 I think it is this tragedy that moves me to show how real Judaism doesn’t have to be afraid of any challenge, and that struggle and doubt are part of its tradition. In many ways, its multifaceted and contradicting opinions are the proof of its strength. My unusual and often controversial essays and lectures are the outcome of this conviction. So I believe that the tragic story around Spinoza has greatly influenced me. In some way, Spinoza’s image is always in front of me when I think about the topics I write and speak about. In fact, an actual portrait of him, painted by my father when he was hidden in Amsterdam during the Shoah (Holocaust), hangs in my study! A welcome reminder. This brings me directly to the Kotzker Rebbe, Rabbi Menachem Mendel of Kotzk (1787-1859). I’ve always wondered what would have happened if Spinoza had met the Kotzker. They lived in different centuries, but I would love to write a play about this! Both were obsessed with truth, but each approached it from a different point of view. In Spinoza’s pantheism, there is a strong Kabbalistic element but, simultaneously, a denial of a personal (biblical) God. However much some Spinoza scholars want to claim that all of his philosophy was based on ratio (pure reason), it is very clear that there are ambiguous elements in his philosophy that reveal aspects of mysticism! Both were searching for God and knew no compromise. What the Kotzker Rebbe could have shown Spinoza is that the Judaism he left behind and detested was terribly puritanical, dogmatic, and not authentic. It was deeply rooted in the experience of the Marranos, preferably called Conversos—Jews who were forced to become Catholics during the Inquisition. For hundreds of years, they were brought up in the Catholic Church and transplanted its ideas into the kind of Judaism that prevailed in the Portuguese Spanish Kehilla in Amsterdam. In many ways it was Christianity without the cross, combined with large doses of religious law and ritual, which was completely misunderstood. Faith was seen as obedience and bowing to a higher authority without any personal input, rooted in blind routine. Spinoza strongly objected to it but never took the time to investigate whether real Judaism would actually agree with this notion. The Kotzker would have taken Spinoza by the ear and shlepped him out of this kind of Judaism, showing him that the truth was very different, although Spinoza was probably more levelheaded than the Kotzker who was very eccentric. For the Kotzker, it was rebellion that was the essence of Judaism, not spiritual capitulation. According to him, Judaism was against any kind of conformity and outward appearances, even those hallowed throughout the generations. He referred to a person as “worse than a scoundrel” if he offered a prayer today as he did yesterday. (How many religious Jews, including me, understand this?) Outside pressures didn’t work for the Kotzker. Pleasing anybody—even oneself—was a tragedy, and learning Torah was seen as a danger if it turned into accepting its claims without tearing them apart so as to discover what it really says, however uncomfortable that may be. Anything else is Avodah Zarah (idol worship). Both men worked to bring about a spiritual renewal, but Spinoza was so boxed in and limited by the Judaism he found in Amsterdam that he couldn’t liberate himself from it without leaving and condemning it altogether. This is still a problem for many Spinoza experts today. Most do not manage to bypass him and have a fresh and honest look at Judaism. They are completely indoctrinated by Spinoza’s misguided reading of Judaism. The Kotzker could have saved Spinoza and them from this very tragedy. It is for this reason that my Judaism has been influenced by the Kotzker Rebbe and that I rebel against the commonplace Judaism I encounter today in most Orthodox communities. Not that my personal conduct lives up to the requirements of the Kotzker—they are sometimes too radical—but I make an honest effort. It is extremely hard, but I see it as the only authentic representation of Judaism. That some of my opponents call me an apikores (heretic) is very understandable. They want me to walk the walk and talk the talk, but this is completely impossible for me. I consider it a falsification of Judaism. My whole personality objects to it. I would rather walk out altogether than go for this kind of forged Judaism. Better to follow Spinoza, who was honestly looking for the truth, and then somehow (unlike him) find a genuine path to Judaism. I believe that Spinoza’s story was the greatest tragedy in modern Jewish spiritual history, second only to the tragic story around the false mashiach Shabbetai Zvi, which took place in the same century. With Spinoza’s breaking away from Judaism, we entered the world of Jewish secularism, which over the years has become a major force that is still alive and well today. Next Post ¿Tienes miedo a envejecer?